Combine flour, salt and baking powder in a food processor. Pulse two times to combine. Combine 1/3 cup oil and 1/4 cup water in a small measuring cup. With processor on, slowly add the oil and water mixture through the food chute. Process until dough is crumbly but holds together. Turn dough out onto a lightly floured surface. Knead one minute and add additional flour if necessary in order to prevent the dough from sticking. Gently press dough into a 5 inch disk and wrap in plastic wrap. Chill for 30 minutes. Combine remaining 1 tablespoon of olive oil, zucchini, squash,garlic and crushed red pepper in a large bowl. Stir gently to coat completely. Combine ricotta and next 7 ingredients (through salt) in a medium bowl, stirring to combine. Preheat oven to 400. Unwrap dough, and roll into a 14 inch circle on a lightly floured surface. Place dough on a baking sheet lined with parchment paper. Spread ricotta mixture over dough, leaving a 2 inch border. 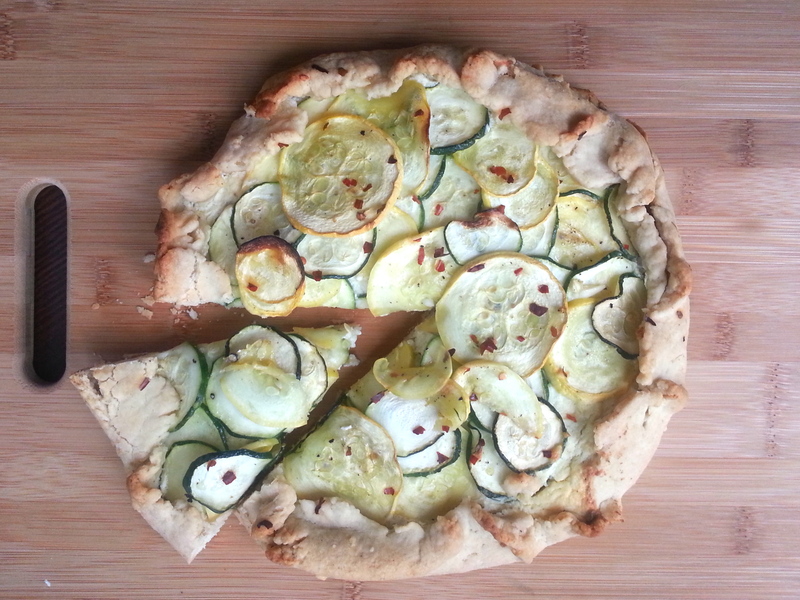 Arrange zucchini and yellow squash alternately, slightly overlapping, in a circular pattern. Sprinkle with kosher salt and fresh ground pepper. Fold edges of dough toward center pressing gently to seal (dough will only partially cover squash). In a small bowl, whisk together 1 teaspoon of water and egg white. Brush dough edges with egg white mixture. Bake at 400 for 40 minutes or until golden brown. Cool 5 minutes and sprinkle with basil. Cool an additional 15 minutes. Cut into 6 wedges. This entry was posted in main dish, sides, veggie and tagged basil, cheese, dough, galette, ricotta cheese, squash, summer, yellow, zucchini. Bookmark the permalink. Oh, Erin! This sounds so tasty. It’s veggies and cheese and carbs wrapped up all in one. Yummm. My Italian self is drooling. Did you say tomato coulis dipping sauce? Yes please. Yes it was…gone quickly. Bread and tomato and cheese??? 34 seconds. I would totally go for some of this now!! I wish I had more. Pasquale ate it and didn’t share with others.